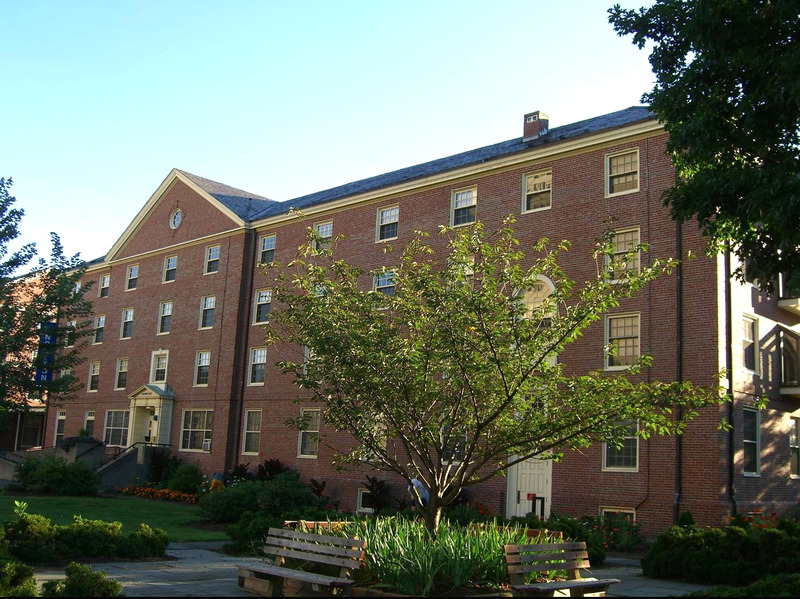 Knowlton Hall is an approximately 35,000 square foot residential building on the Amherst campus of the University of Massachusetts, one of ten structures comprising the Northeast Residential Area. The L-shaped building is 4-stories with a basement level accessible to grade at the rear (east) elevation. The south wing is 8 bays wide by 3 bays deep with a gable roof. The north wing is 8 wings wide by 3 bays deep and also has a gable roof that forms a hip at the building’s northwest corner. The main building entrance occurs at the 3 central bays of the north wing’s west elevation. These bays project from the façade and are distinguished by a cross gable. This elevation also includes a 2-story wing with flat roof that serves as an accessible terrace. The terrace is bounded by a wrought-iron railing. Named in honor of Helen Knowlton (1879-1941), Professor of Home Economics 1924-1941 and first Head of The Homestead 1928.